A few weeks ago, we wrote about the oriental fruit fly, which has the potential to be a severe pest to fruits and vegetables in Florida. The oriental fruit fly is commonly trapped by DPI and sometimes spurs eradication programs. This June, three males were caught in Miami-Dade county. Growers in the area are encouraged to monitor for this pest in their crops. Please read this DPI Pest Alert for more information about the oriental fruit flies DPI trapped this June. You can also find more information on the Featured Creatures page. 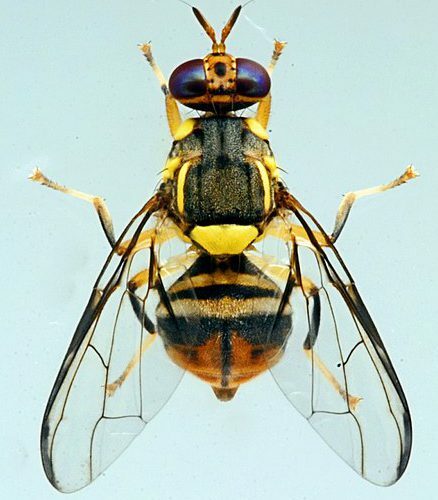 If you suspect you have found an oriental fruit fly, contact the DPI Helpline (1-888-397-1517), or send a specimen to the UF Insect Identification Lab.